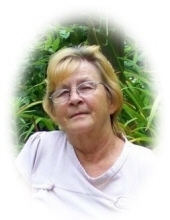 Ms. Betty Jane Hamby Frisby, age 70 of Carrollton, Georgia died Sunday, November 18, 2018. Ms. Frisby was born in Greenville, South Carolina on March 13, 1948, the daughter of the late James Bernard Hamby and Dora Beatrice Scott Hamby. She was retired manager of Flowers Thrift Store and of the Baptist faith. Survivors include her sons, Marvin Lamar Frisby of Carrollton, Richard Lee Frisby of Carrollton; daughter and son-in-law, Katherine and Frank Cole of Woodland, Alabama; grandchildren, Ryan Cody Gammon, Sheena Gammon, Chasity Marie Jackson, Christy Elaine Frisby; seven great grandchildren; sister, Mary Elizabeth Ashcraft of Mt. City, Georgia; brother-in-law, Steve Randall Archer and numerous nieces and nephews. Besides her parents, she was preceded in death by her sisters, Brenda Fay Hamby, Carolyn Frisby, Barbara Elaine Jenkins, Sherry Diane Archer, and brother, Larry Earl Hamby. The family will receive friends at Almon Funeral Home on Friday, November 23 from 12noon until 2 p.m.
Funeral service will be Friday, November 23 at 2 p.m. at the chapel of Almon Funeral Home with Pastor Scott Whaley officiating. "Email Address" would like to share the life celebration of Betty Jane Frisby. Click on the "link" to go to share a favorite memory or leave a condolence message for the family.